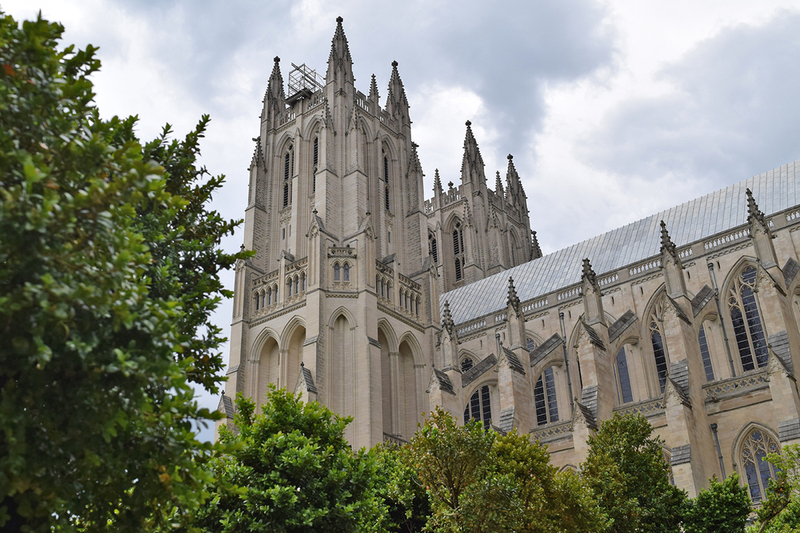 Tucked in the shadows of the majestic, towering Gothic structure that is the Washington National Cathedral is the almost-overlooked oasis of The Bishop’s Garden. This secluded spot feels hidden, offering an escape from the tourists that swarm the grounds to gawk at the grand architecture and tour the interior of the church. While some might worship deities and saints inside the cathedral, I prefer to find my spirituality outdoors in a more natural setting such as this. Where one might expect to find an ostentatious horticultural display crammed with crosses and overt religious symbolism, instead sits a place of no agenda other than quiet contemplation. Step through the ivy-covered limestone archway and the sunken garden spreads out below, accessible from a flagstone path that winds down the slope into a space designed to resemble the interior of a medieval monastery. In keeping with this vision, the garden is an equal mix of utilitarian plantings of herbs and fruit trees and the open spaces and beauty of a pleasure garden. I was quite taken by the bearded irises on display during my visit, huge rust-orange blooms bobbed over the stone pathway, competing for attention. It originally served as the residential grounds of the bishop of the cathedral, so a sense of privacy and solitude pervades every corner of the various garden rooms. Nowhere is this peacefulness more evident than the Bishop's Lawn, a pleasing open area encircled with impressive trees and flowering bushes creating a natural border from the bustle beyond. The grounds of the cathedral on the hills of Mount Saint Alban were designed by famed landscape architect Frederick Law Olmsted Jr, who was involved with the planning of some of the city's most iconic outdoor areas, such as the National Mall. 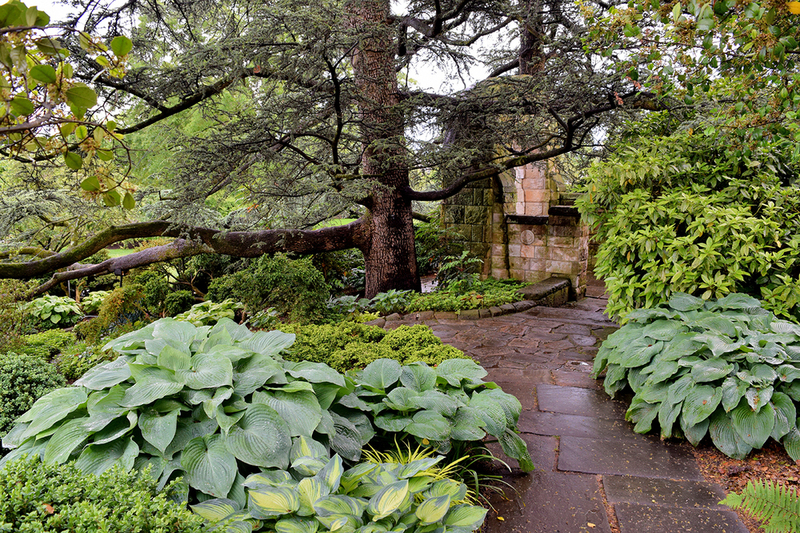 His original designs for the Bishop's Garden were enhanced by the tremendous efforts of Florence Brown Bratenahl. She founded a society of volunteers and donors who imagined it as a "garden for the ages". Ancient boxwood bushes and impressive older trees were acquired alongside donations of medieval sculptures and weathered stone fountains that blend into the setting like they had always been there. Following an earthquake in 2011 that caused significant damage to the cathedral itself, a huge crane that was repairing the main building fell and crushed the main archway as well as many of the older trees and bushes that border the garden. This setback only seems to have breathed new life into the garden and ignited passionate responses from those invested in its preservation. 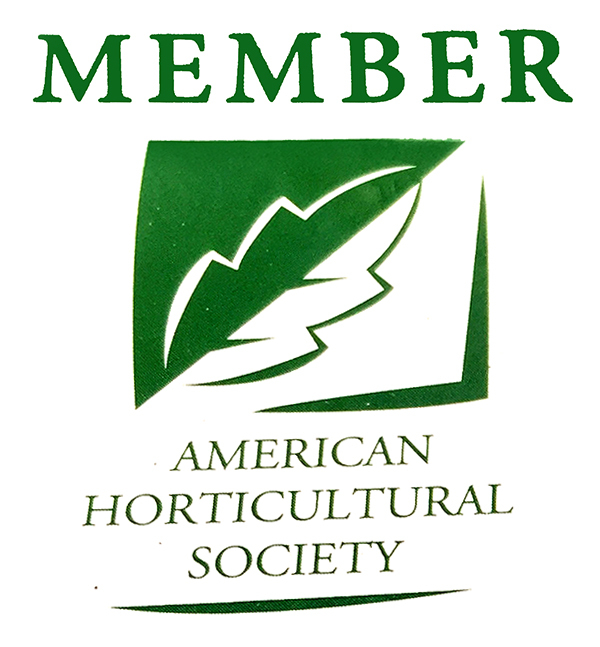 The garden has since bounced back from the damage and emerged all the better with newly redesigned elements and replacement of ailing older plants with hearty new specimens.